BJA deliver innovative projects across a diverse spectrum of building types and values from $200K to $60M. Our work spans architectural design, ESD, interior design, master planning, urban design and landscape design + water sculpture. Our portfolio includes multi residential projects, eco villages (site planning + individual dwelling designs), disability ‘group homes’ meeting prescriptive access standards, ESD and alternative ‘off-grid’ homes in rural landscapes plus innovative solutions to single dwelling’ alts & adds’ in response to complex planning regulations. Our collaborative process allows the Client to manage decisions and finances & collaborate closely in design – or delegate, whilst BJA craft site specific, unique homes that enhance lives and the act of dwelling. BJA have been integral to the planning, design and construction of numerous independent and community schools throughout Australia.We are recognised as leading practitioners in the field of school campus + classroom design and have a wealth of experience delivering fit for purpose, responsive, value engineered, nurturing school environments. As most school’s building programs are staged over many years in response to growth of student numbers, demographics, evolution in leadership &/or philosophy and available finances, BJA provide continuity of the planning vision (see Master Planning) whilst offering flexibility and adaptation through long term committed relationships with each school community. The Directors’ integral working knowledge of Rudolf Steiner philosophy and arts translates into a design sensibility that supports living processes within each of us and Nature. We value the imaginative vs the abstract, the sensual vs minimalism, engagement vs fragmentation. This creative design foundation avoids stylistic dogma and seeks instead, unique design solutions that emerge from the play between the people, the place and the purpose. Steiner pedagogy strives to develop pupils’ intellectual, artistic, and practical skills in an integrated and holistic manner, valuing imagination & creativity. BJA have been integral to the planning, design and construction of more than 20 Steiner schools throughout Australia over a 30-year span. We create site responsive, customised, nurturing school environments that engender Steiner principles and practice. 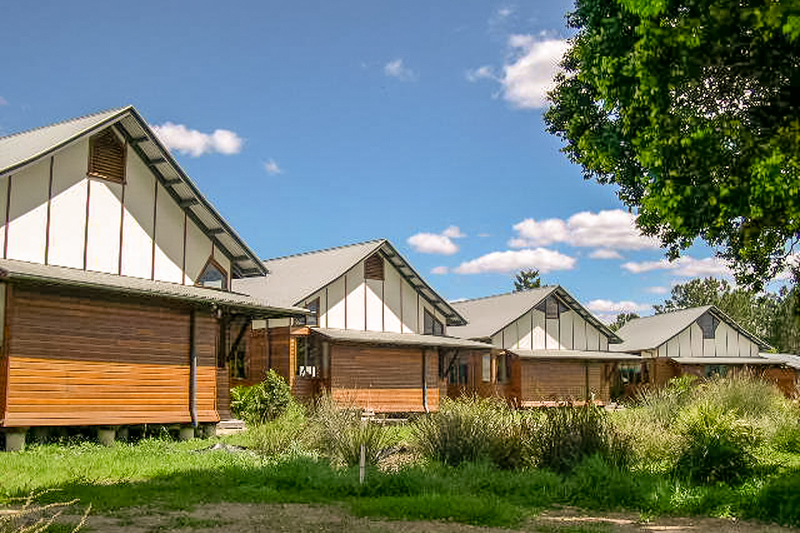 Our personal commitment and understanding of the Steiner philosophy means we are able to create a supportive architectural environment that gives expression to Steiner’s educational impulse. BJA value our long term committed relationships with many Steiner school communities with whom we have worked alongside from building or adapting the earliest single building classroom right through designing state of the art technical high school facilities. Master Plans, whether for schools or eco villages in semi-rural zones or multi-lot commercial properties on urban CBD sites, aim to optimise the use of a site. BJA weigh up planning code and site constraints + opportunities with client intention and budget to identify & clarify options and logical phases for cost-effective, sustainable development strategies. Solutions recommend most favourable building forms, siting, facilities and arrangement plus staged growth. BJA prepare Master Plans for whole school campus’. We work alongside schools to plan for the transition from single stream early childhood & primary to multi-stream and/or secondary schools. Master Plans also anticipate multi-site school expansion plus staging and adaptive re-use and rationalisation of infrastructure and services, landscape and access strategies. 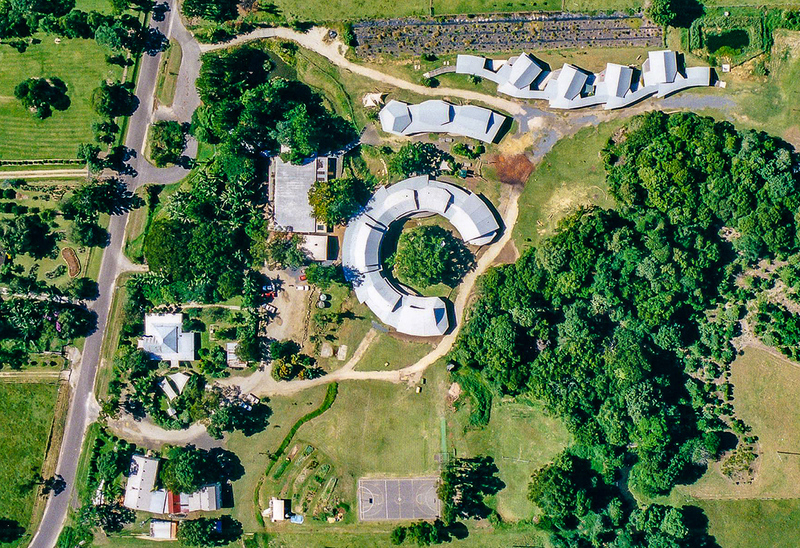 Shearwater (Mullumbimby), Glenaeon School and Mt Barker School (SA) Master Plans have been implemented over 30 years and updated several times. Master Planning underpins Government Grant applications which are critical to many schools’ development plans. Lorien Novalis School, Kamaroi R S School & Mumbulla School amongst many, have been successful in receiving grants for specific building projects implementing each School’s Master Plan. BJA workshop with stakeholders to establish a Brief, then translate this into a schedule of required facilities, spatial/areas, functionality and priorities. 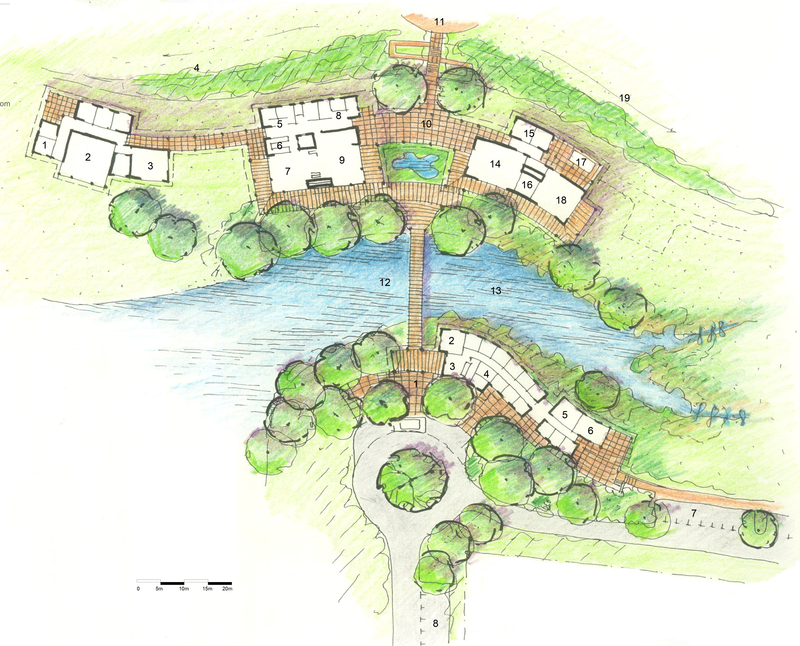 This combined with comprehensive site analysis and urban & landscape design principles, informs the design of the drawn site strategy plans. Commercial projects often begin with architectural Feasibility Studies that consider design opportunities in response to planning controls, permissible floor area, site context and financial parameters such as cost to construct vs rental yield and disruption to business costs. Residential Feasibility Studies investigate optimal site layouts within planning constraints, demolition vs refurbishment, likely issues to resolve and preliminary costings. BJA undertake a diverse and extensive range of projects from restaurants to retail, wineries to aircraft maintenance hangars, housing developments to showrooms, warehouses and offices. Many of our clients seek a built expression of their company values. They understand that the quality and character of the environment is essential to create a harmonious and productive workplace. The external expression of the buildings’ form enhances branding whilst the response to context is also critical to identity and place making. BJA provide feasibility studies, value engineering, assessment of planning controls, building regulations & standards specific to each project. We collaborate with experienced teams of professional consultants to deliver integrated built solutions. We then monitor development applications through local government approval processes providing critical timely input to facilitate the process. We work closely with individual developers to create optimum design solutions on tight urban sites with limited or no vehicular access, with Heritage constraints, in iconic Manly beachfront tourist precinct and other urban centres. Examples; 88 The Corso, 110 The Corso, Rollers Café Rialto Lane, Prosperity Parade. We worked within the Access and Disability Advisory Committee (ADAC) and Urban Growth project Management structures on specific projects. Our passion is to go beyond the standard solutions to create homes that meets the resident’s excitement to be living independently, with support, integrated into society. Our responsive architecture provides for their individual needs within a warm domestic environment. BJA is committed to creating equitable places that respect and anticipate differences and shared human experience. Sustainable principals are intrinsic to our design solutions. BJA employ sound ESD principles augmented by ESD innovations. These include: optimised building & glazing orientation, thermal mass, low embodied energy material specification, shading, ecological water + waste water management, alternative energy systems, passive heating & cooling systems like night flushing, improved insulation & ventilation systems and landscaping strategies for cooling and water retention/re-use, in addition to current mandatory energy + water saving & thermal comfort performance requirements. We work with specialist ESD consultants to advise and design systems, which has resulted in innovations such night flushing systems, the use of heat pumps with hydronic systems to reticulate hot water in slabs, improving overall thermal performance and costs. 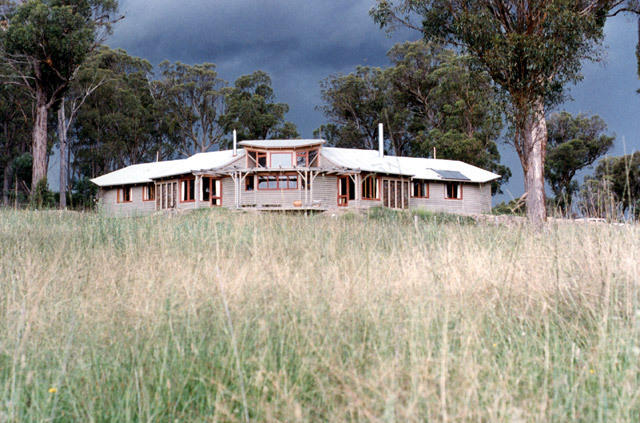 The Barrington eco house is self-sufficient using ‘off the shelf’ systems and good design practice. PV cells generate power, rainwater is collected and stored for re-use, sewage is treated on site. Solar panels are backed up by a fuel stove for in-slab reticulated water for space heating, and the micro climate is moderated using water cascades. This is all within the context of a healthy bio-dynamic farm! We promote the use of non-toxic paints, particularly in our school projects, and ensure natural light and cross-ventilation plus optimal solar access and appropriate thermal mass. The increasing incidence of allergies has seen a growth in the availability and usage of non-toxic paints and building boards. Healthy environments provide optimum learning and living. ESD has an ethical dimension in reducing the impact of our footprint on the planet and creating intergenerational equity, to which BJA are committed.